22 S PRIN g 2019 PracticeLink.com The University of Maryland Medical System (UMMS) is a university-based health care system that provides health services to the residents of Maryland. With more than 150 locations, including 11 community hospitals and two specialty hospitals, UMMS not only offers a choice of urban, suburban and rural locations, but also a choice of academic, teaching and community practice settings. The health of Maryland is our top priority, but so is the fulfillment of our employees. UMMS offers: • A healthy work-life balance. • An abundance of primary care, specialty, and academic and research opportunities. • Competitive compensation and comprehensive benefits including: Relocation assistance, malpractice and CME reimbursement. By choosing a career with UMMS, you are electing to join a distinguished network of innovators that bring world class resources to our communities and beyond. Make an impact with UMMS and choose to be a part of something greater. Be a part of something greater Hospital Physician Office ■ ■ ■ ■ ■ ■ ■ ■ ■ ■ ■ ■ ■ ■ ■ ■ ■ ■ ■ ■ ■ ■ ■ ■ ■ ■ ■ ■ ■ ■ ■ ■ ■ ■ ■ ■ ■ ■ ■ ■ ■ ■ ■ ■ ■ ■ ■ ■ ■ ■ ■ ■ ■ ■ ■ ■ ■ ■ ■ ■ ■ ■ ■ ■ ■ ■ ■ ■ ■ ■ ■ ■ ■ ■ ■ ■ ■ For more information about opportunities at UMMS visit www.ummsphysician.jobs. RIGHT HERE IN DELAWARE. At Bayhealth, our physicians have access to sandy beaches, boutique and outlet shopping, and countless water sports. With major cities like Philadelphia, Baltimore and New York within close driving distance — the possibilities are endless. 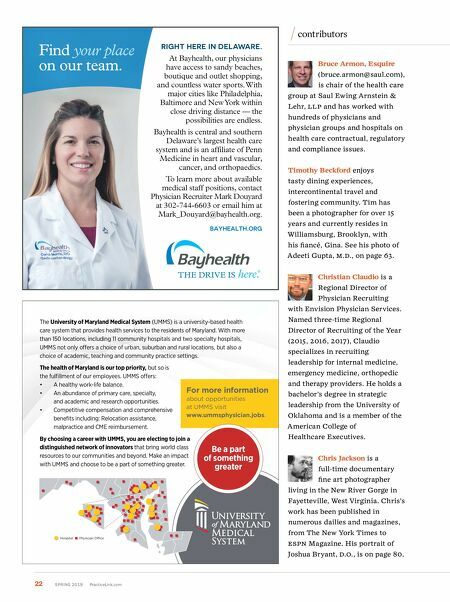 Bayhealth is central and southern Delaware's largest health care system and is an affiliate of Penn Medicine in heart and vascular, cancer, and orthopaedics. To learn more about available medical staff positions, contact Physician Recruiter Mark Douyard at 302-744-6603 or email him at Mark_Douyard@bayhealth.org. BAYHEALTH.ORG Find your place on our team. contributors Bruce Armon, Esquire (bruce.armon@saul.com), is chair of the health care group at Saul Ewing Arnstein & Lehr, ll P and has worked with hundreds of physicians and physician groups and hospitals on health care contractual, regulatory and compliance issues. Timothy Beckford enjoys tasty dining experiences, intercontinental travel and fostering community. Tim has been a photographer for over 15 years and currently resides in Williamsburg, Brooklyn, with his fiancé, Gina. 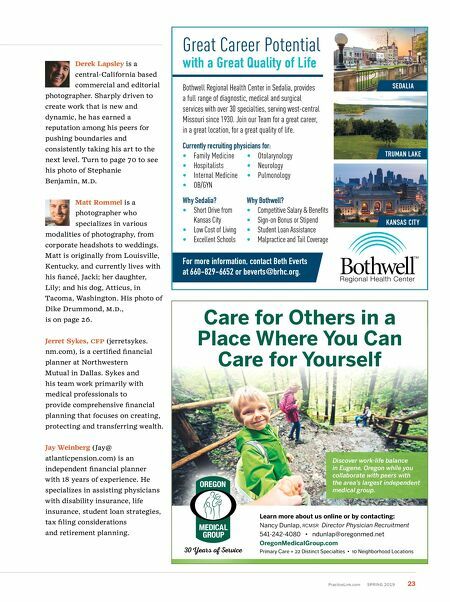 See his photo of Adeeti Gupta, M.D., on page 63. Christian Claudio is a Regional Director of Physician Recruiting with Envision Physician Services. Named three-time Regional Director of Recruiting of the Year (2015, 2016, 2017), Claudio specializes in recruiting leadership for internal medicine, emergency medicine, orthopedic and therapy providers. He holds a bachelor's degree in strategic leadership from the University of Oklahoma and is a member of the American College of Healthcare Executives. Chris Jackson is a full-time documentary fine art photographer living in the New River Gorge in Fayetteville, West Virginia. Chris's work has been published in numerous dailies and magazines, from The New York Times to e SPN Magazine. His portrait of Joshua Bryant, D. o ., is on page 80.